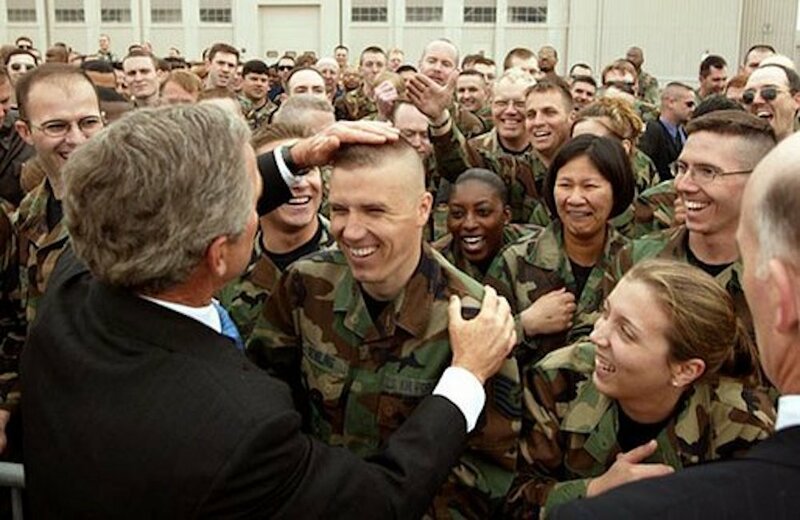 President George W. Bush provides a touch-up on a soldier’s haircut as he greets military personnel at Wright-Patterson Air Force Base in Dayton, Ohio, April 24, 2003, during the U.S. invasion of Iraq. Photo courtesy of George W. Bush White House Archive. In the United States today, citizens often express their patriotism through the celebration of military service. Politicians, sports leagues, and charities ask Americans to show special reverence and gratitude to military personnel. Such an attitude is not as traditional as it may seem. In the mid-19th century, as the United States faced war with Mexico, professional soldiers were not seen as patriots or exemplars of anything. In 1846, when President James Polk began his effort to strong-arm Mexico out of much of its territory, the first instrument at hand was the U.S. regular Army. While its officers were typically from the middle class, rank-and-file soldiers were mostly poor men who joined the Army because it offered food, clothing, and shelter. These men, often immigrants, had found it hard to earn a steady living in the tumultuous, rapidly commercializing cites of the East, and did not have enough money to migrate to the West. They were part of a mobile workforce that moved from hard job to hard job, scrambling to make a living. They lacked the means to settle down and become respectable citizens with families. The few testimonies they left behind indicate that they joined the Army because they were ragged, hungry, and out of options. Most Americans saw these men as lazy and shiftless people who had willingly given up freedoms they should have prized as Americans by signing five-year Army contracts that subjected them to the kind of harsh physical discipline usually only meted out to slaves. During the Mexican war, the regular regiments fought hard and well, but the few rank-and-file men who wrote about their experiences did not list patriotism as an important motive. They said that they were motivated by professional pride and their love of their comrades. To their credit, they rarely committed crimes against Mexican civilians. 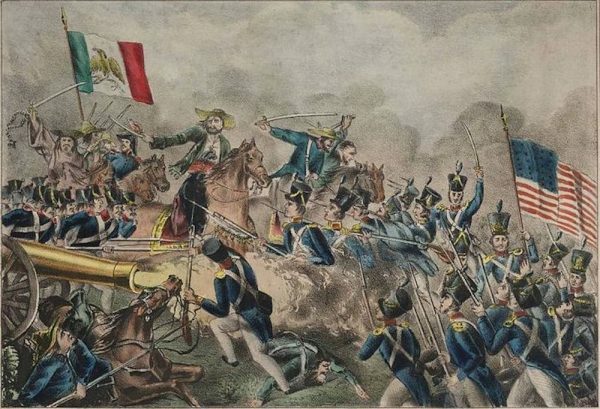 Illustration depicting the Battle of Cerro Gordo, an important U.S. victory during the Mexican American War. Art courtesy of Wikimedia Commons. But the Mexican war would temporarily change the very nature of the American military. The U.S. regular Army was not large enough for the war against Mexico, so when Congress authorized military action it also authorized the government to raise thousands of men organized in volunteer regiments. These men were very different from the regular Army recruits. As news of the first clashes along the Rio Grande swept through their towns and counties in 1846, thousands of young men listened to patriotic speeches and signed up for regiments from the various states. Their hometowns sent them off with music, speeches, and banquets. These men were wealthier than the regular soldiers, and they viewed their service as an expression of their patriotism and a chance for adventure. The volunteers saw themselves in many ways as the embodiment of Jacksonian democracy, which extended citizenship to all white males and invited them to pursue their dreams by dominating others, especially African Americans, Native Americans, and, now, Mexicans. The volunteers were, like the regulars, often militarily successful, but they had little else in common with them. Professionalism and discipline held little attraction for them, and they often committed crimes against Mexican civilians. This divide between regulars and volunteers would prove to be a defining one. Regulars and volunteers were both necessary to American military success and suffered hardship, injury, and death. Those who survived often had traumatic memories of battle violence, or of the helplessness they felt as they watched friends die from illness. But regulars and volunteers had very different experiences at the end of the conflict. When the war ended, the volunteers were greeted as returning heroes, with parades, speeches, barbecues, balls, and banquets. Their fellow Americans celebrated them as citizen-soldiers, the embodiment of American patriotism. Many settled down to start families, and hundreds soon wrote memoirs about their experiences in Mexico. The regular soldiers were not feted. Most still had not completed their terms of service, and they moved quietly on to new military postings. One of them, Alonzo Sampson, wrote that “there were plenty of us who had no home, strictly speaking.” These men remained, in effect, rootless laborers employed by the government. America’s disparate treatment of its regular soldiers and the temporary soldiers enlisted for major conflicts continued for many decades. Recruited from the laboring classes, regulars were typically either forgotten or actively despised. In contrast, soldiers recruited or conscripted for temporary service in the Civil War, the Spanish-American War, and World War I were celebrated as patriots. This divide in society’s attitudes toward regulars and volunteers ended when World War II and the Cold War brought 35 years of continuous conscription. This broader militarization of society helped firmly associate service with patriotic duty, at least for a time. The Vietnam War ended this pattern—and eventually returned the United States to what had been its historic norm: reliance on a professional military filled with people who may have patriotic motives but also are often motivated by the paucity of economic alternatives. However, we have not returned to the past in which Americans did not view the professional military as patriotic. Instead, our era has produced a new dissonance, in which we seek to have it both ways. Most of us celebrate the service of our soldiers as they pursue wars that seem to go on forever, but few want their own sons and daughters to put their lives on the line, and most of us avoid sacrificing anything at all. As a result, there is a gulf of separation between most Americans—and especially economically secure Americans—and the relatively small group of people who constitute our all-volunteer, professional, armed forces. It’s as if we’ve gone back to the regular Army of 1846 or 1876, but without the open contempt. Peter Guardino is Professor of History at Indiana University. He recently published The Dead March: A History of the Mexican-American War (Harvard University Press, 2017), which explores the experiences of ordinary Americans in Mexicans during the 1846-1848 conflict.